The No. 18 Georgetown men’s lacrosse team (1-0, Big East) opened their 2019 campaign with a 13-10 victory over Sacred Heart (0-1, Northeastern) Saturday afternoon at Cooper Field. 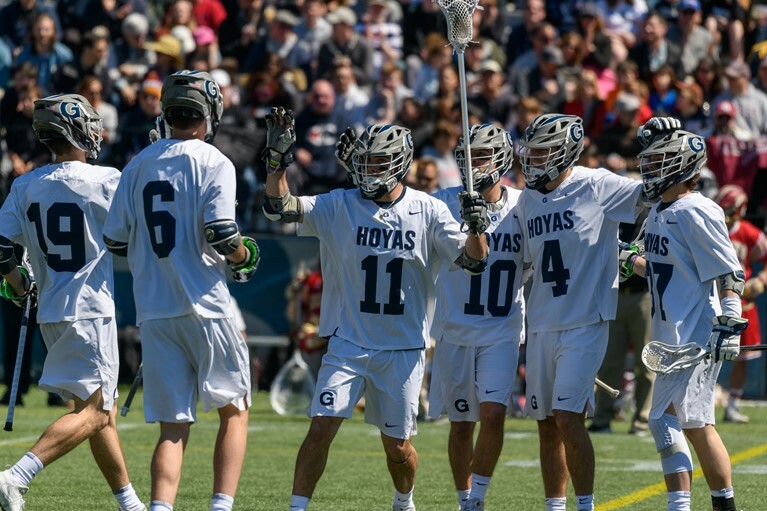 Senior attackman Daniel Bucaro led the Hoyas with seven points courtesy of three goals and four assists, while junior attackman Jake Carraway added five points from three goals and two assists. Defensively, the Hoyas were anchored by the play of sophomore goalie Owen McElroy, who totalled 16 saves on the day. The Hoyas got off to a slow start, falling behind the Pioneers in the first quarter, 3-1, following back-to-back goals. The game was back-and-forth for the remainder of the first half, as Carraway and Bucaro scored or assisted on the Hoyas’ next four goals, ending with Georgetown taking a 5-4 lead into the halftime break. Georgetown found some breathing room in the third quarter, as the Blue and Gray responded to a Sacred Heart score out of the break with three straight goals to make it 8-5 with 6:32 left in the third quarter. From there, the Hoyas maintained a three-to-four goal edge for the remainder of the match, exchanging scores with the Pioneers. Sacred Heart scored its final goal of the match with just six seconds remaining, giving Georgetown a 13-10 final edge and a 1-0 start to the new season. The Hoyas are back on the field on Saturday, Feb. 16, as they take on Robert Morris (0-1, Northeastern) at Cooper Field. The game is slated to start at 12:00 p.m. ET. Follow @GUVoiceSports for breaking news and more coverage of all Georgetown athletics.